Featuring the innovative â€œAuto Picture Mode,â€ the Pentax ZX-7 is so smart that if completely frees you from complicated exposure control! It will automatically select one of five Picture Modes: landscape, close-up, action, portrait or standard program based on your subjectsâ€™ distance, lens focal length and movement, and tells you about its decision via the illuminated mode dial and the viewfinder indication. Numerous 35mm cameras, primarily Pentax and Nikon. Intuitive for a old manual Pentax SLR user; controls are where they should be; on th RH side (sorry if you're a Leftie!) Had the Pentax 'feel' even if I've come from a Spotmatic F II. Total confidence.. it's a Pentax! I never thought I'd go this far after SPII. Great Camera the MZ7; great to still be with Pentax. It won't allow me to shoot outside light parameters; shutter locks. Maybe I havn't learned to override the clever beast? Ease of use. Auto setting Manual setting. Exposure control. Panoramic function. Cant really say it has many weaknesses but the following comes to mind: Focusing in dimly lit situations Although it feels fairly solid, there is a lot of plastic on this thing. Not sure if it's just me - but this camera seems somewhat difficult to clean inside.....hard to reach areas. Purchased for just over $400 CDN w/28-80 and accessories including Haze filter and bag. Very surprising little camera that acts a lot bigger than it is. It also acts a lot more expensive. A fantastic value for the features you get. Many will love the fully automatic 'watch it do it's thing' operation but you can take charge if you so desire and change aperture etc. and focus manually. A great one to learn on as it tells you what it's doing at all times in automatic mode. Just watch and learn...then take what it showed you and apply. Mind you, it's pretty hard to out smart the MZ-7 - let it do its thing and you will get outstanding pictures every time. The only issue I have is auto focusing in dimly lit situations...it seems to search a fair bit. Other than that this is a fantastic value that would cost a lot more if it didn't say Pentax on the front. I bought the Pentax zx-7 around 3 years ago now and it is an absolute jewel. It takes exceptional pictures and has an array of features that are usually not available for SLR cameras in this price range. I use it pretty often, shooting around 30 rolls/ per week and it has never let me down. The body is made mostly of stainless steel and is extremely durable. The quality of the pictures are absolutely exceptional. I'm a bit of a novice, but many of my shots look very professional. Further the camera is easy to use and gives one the option of using an array of automatic shooting functions. PANORAMIC!!!! illuminated dial and screen aluminum lens ring priority memory optional remote(can be bought from pentax, i got it!) nice strap w/ pocket for remote lighter than competition ease of use auto mode can't go wrong extended warranty is top notch! Ihave had this camera since May, 2000, and i must say that it is outstanding!!!! If i had to guess i would say that i've taken about 50 or so rolls and it's still amazing! I opted for the extended warranty when i purchased it and recently found out that i'm entiteled to a free check-up. they retune the camera, blowit out, and make all necesary adjustments, for free, all u have to do is pay for shipping there. I'm actually goin to send it out this weeek, seeing as how it's been to italy, greece, and colorado, and i'v had it for half of the term of the warranty, so off it goes. The one feature on the camera that blows the Cannon EosRebel out of the water is the panoramic fuction. i have not found another SLR that does this. Also the illumintaed screen and switch are clutch! I go on tours of Europe and most people have the cannon Rebel, one they got a feel of how much lighter and balanced and more functional mine was compared to them, they started crying that they paid more for their Rebels, HA!!! I say!! my mother still has her pentax circa 1973 and it takes outstanding pictures!!! I've taken it all over a 2 week trip of italy and we went everywhere. i took about 18 rolls in 2 weeks! and all of them came out crisp, coorful, bright, and amazing!!! I like to play around in manual, but when ur in venice, rome, florence, and capri for 2 days, u have no time to play around, any moron could use it. So what im trying to say is, buy this camera ;)!! emailed once w. a question and responded promptly. Note: When you consider the $, these probably aren't weaknesses: ... No spot-metering option ... No continuous autofocus ... No exposure auto-bracketing ... No depth-of-field preview ... Not as many lens options available as Nikon. Great value Ease of use Fast (2fps) film advance Good optics Great size, weight makes comfortable for the user. Low light focusing can cause lense to hunt a little too much Case made of plastic. Probably the best camera a beginner could buy because it provides both manual and automatic functions. Play around with it in manual when you have lots of time to shoot, and in Auto Picture mode when you want to camera to make the split-second judgements. Mine came with the 28-80, and I recently included the 80-320 to my bag. Have shot a few pictures that are beautiful with this camera, no complaints. However, as I am getting past the beginner stage of photography, terms like depth of field preview, lock-up mirror and aluminum-alloy die case body are leading me to consider something a little higher end. All that said, my MZ-7 is a durable SLR that takes great pictures for a fraction of the cost of other cameras. The shutter sticks, auto flash doesn't work. I took it to Pentax warranty center and they are going to have it for 2 months. Very disappointed in this. Missed my 2 sons birthdays, and our family vacation. This is a very nice camera with excellent features for beginners. The warranty department in Utah is a joke. They will have my camera for 2 months to fix it. I give this camera 4 stars for value and 1 for overall because we missed a lot of memorable times this year. I purchased this camera because of its automatic features. I bought my Pentax ZX-7 brand-new on Ebay with a 28-105mm Sigma Aspherical Lens and a Sigma 70-300mm Macro Lens. I do wedding photography, I had been using a Manual Minolta X-370s as my main camera. Although the Minolta took great pictures, it took to long to adjust f-stops, shutter speeds, and to focus. So I decided to buy an automatic SLR. I tried a Nikon N80 and a Canon Elan 7. 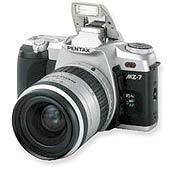 The Pentax ZX-7 had the best picture results and the functionality was greater! I this is a great camera for beginners and pros; I LOVE IT!